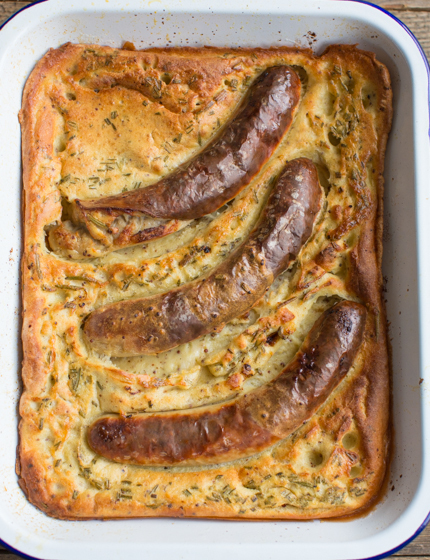 Toad in the Hole is one of those British oddities that no one outside of the UK seems to understand. Well, let me demystify this slightly weird dish for you: it’s basically sausages snuggled in an oven-baked pancake batter, drizzled with gravy. It’s not the most photogenic or elegant dish, but it is what most Brit’s happy childhood memories are made of. 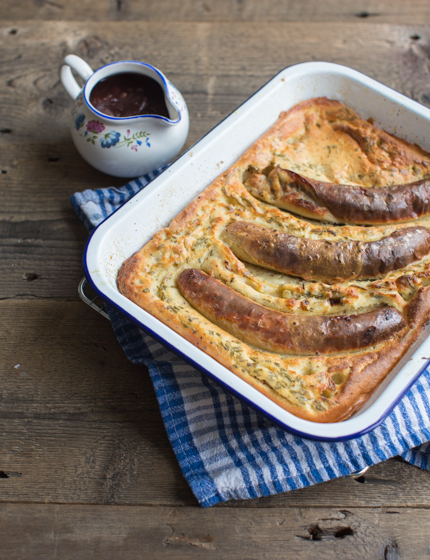 Toad in the Hole is the perfect dish for when you’ve bought sausages for a BBQ party, and it suddenly starts to rain! BBQ cancelled, sausages lying around waiting to be used! So, here’s your solution. 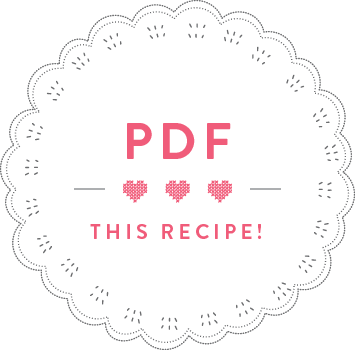 Seriously, why not give it a try on a rainy summer’s day, it’s really such a comforting dish and truly yummy! Start by preparing the batter: put the eggs, the mustard and the rosemary into a large bowl and beat together. Add the flour and beat into a smooth batter, gradually adding the milk and the beer. Season with salt and some pepper. Set the batter aside to rest for 15 minutes. Meanwhile, pour five tablespoons of sunflower oil into a baking tray (approx.. 30x22cm). Prick a few holes into the Grillinger with a fork and lay them into the oil. Bake in the preheated oven for 10 minutes, turning them halfway through. Meanwhile, prepare the gravy. Peel, halve and finely slice the onions. Heat two tablespoons of sunflower oil in a saucepan and fry the sliced onions over a gentle heat for 15 minutes, until meltingly soft. 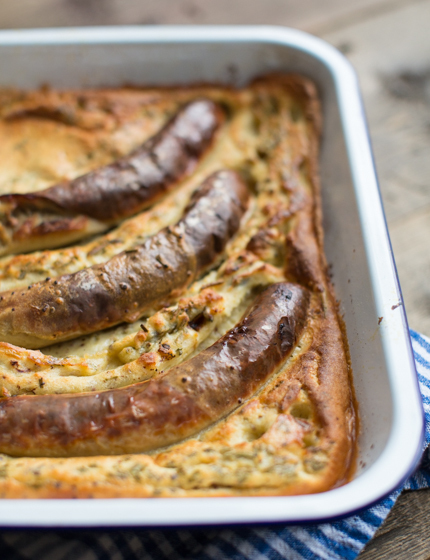 Once the sausages have baked for 10 minutes, take out the baking tray, quickly pour in all the batter and put back into the oven. Leave to bake for 25 minutes without opening the oven door. Continue with the gravy: after 15 minutes, add the sugar and balsamic vinegar and leave to caramelize for 5 minutes. Add the flour and cook for a minute, then add the red wine and cook for 2 minutes while stirring. Add the beef stock and cook for 10 minutes until the gravy has thickened. Season with pepper. 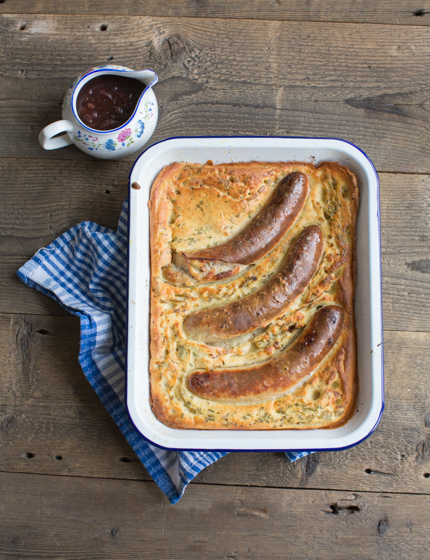 Divide the toad in the hole into four portions and drizzle with gravy.